Remember the official Pokémon reggae song that was released last year in Japanese? Today, it was translated/tweaked so that it’s in English—which means we can take a closer look at the lyrics. And, well...they’re kind of uncomfortable! Let me preface this by saying that we all know that people eat Pokemon. That’s just a fact. In Pokemon Gold & Silver, there’s an entire segment about a Team Rocket operation that cuts off the tails of Slowpoke and then tries to sell them for a hefty sum. It’s all in good fun, and it’s even consistent with the lore, but man: I’d really rather not think about eating my monster pals, you know? The worst part is when I start to analyze the situation here, because the lyrics suggest that Slowpoke actually doesn’t feel much pain. Plus, it’ll grow the tail back, right? Ugh. It’s still kind of weird. 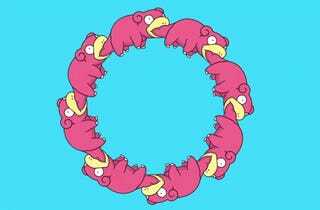 I kind of get the feeling that it’s more OK to joke about eating Slowpoke because it’s one of the not-so-smart Pokemon, which in of itself is fucked up!